Tragedies are not meant to make the audience feel down-hearted. Instead, the audience should feel a pleasurable sense of emotional release. Isn’t that how it goes? I’m no expert in Greek theatre but I feel like the cast and crew deserve extra credit if, at the end of the play, the audience experiences not just catharsis but euphoria. Such was the case after seeing a contemporary reimagining of Euripides’ Bakkhai, at Bunbury’s Cube Theatre, on its opening and closing nights. A heady mix of poetry, dance, music, song and art had woven its magic but it was more than that: I was euphoric because Dionysos and the King of Thebes were played by woman (the former in gold body paint) and this was not Newtown but Bunbury. I was euphoric because the Cube Theatre was wedged between a multiplex cinema and an Eisteddfod; the World Cup was on the telly and there was still a full house. Bakkhai tells of Dionysos (Siobhan Maiden), god of wine, teaching the Thebans a lesson for straying from him. “They will call me god and master,” we are told in the prologue. He seduces and deludes women from Thebes, who join him and his throng of wild women, the Bakkhai. Amongst these is Agaue (Michelle Aslett), mother of Pentheos, the ruler of Thebes. Pentheos (Nina Smith) tries to destroy Dionysos but is himself beguiled and goes into the woods, dressed as a woman, to spy on the Bakkhai. Under her delusion, Agaue kills her son, Pentheos, believing him to be a lion cub (an Angus in this version). Later, her father Kadmos (Andrew Robinson) leads Agaue back to reality and she discovers her gruesome deed. While deliberately colloquial, Sholto Spradbury’s original script is stunningly poetic. Audiences loved his contemporary and regional references: Dionysos rejects rumours he is mortal as “fake news” and tells us “I am from the east – beyond the Porongorups”. Maiden plays Dionysos with all the charisma of a rock star, a vibe reinforced by the witty dialogue. “Here we are now, entertain us,” one of his followers urges, playfully. Pentheus is outraged the Theban women have abandoned their hearths and looms to run off to the hills to dance, drink wine and praise Dionysos. His misogyny and double standards are sadly reminiscent of contemporary demagogues – which is why the gender-flipped casting works so beautifully. The Bakkhai chorus; the play’s beating heart. Photo: Sarah Mills. 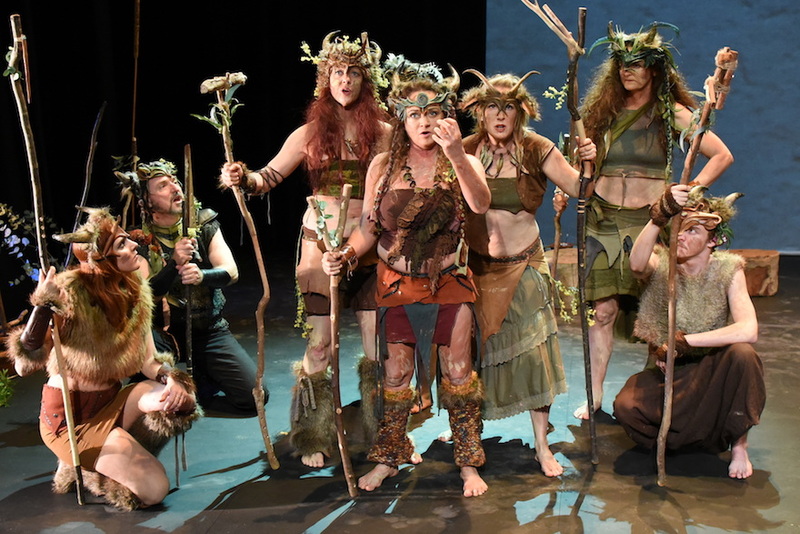 Euripides’ use of the chorus was radical in its time: instead of commenting on the action and reinforcing a moral message, the chorus play the Bakkhai, the band of wild women after whom the play is named. Sky River, Chrissy Maddison, Millie Kitchener, Bec Butterfly, Luke Myors, Sarah Neale and Kelly Mitchell were the play’s beating heart. Their movement, devised through weeks of improvisation and creative play, was guided and refined by Perth-based choreographer Jacob Lehrer. Their performance of songs, composed by Rachelle Rechichi, was worth the price of admission alone. The other highlight, for me, was the projection of Dan Rooney’s hand-drawn animation, depicting the battle scenes during Autonoe’s speech, powerfully delivered by Cherie Fielder. I have a great affection for the South West (I grew up in Esperance and Albany and now spend most weekends in Bunbury.) I love its sense of freedom, its vineyards, its local, slow-cooked food and its concentration of alternative, creative souls. 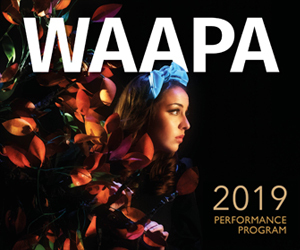 McKenzie has my utmost admiration for harnessing the talents of creatives from Manjimup to Margaret River for this production, since October, and empowering emerging artists. Imagine theatre as a loaf of bread. This production of Bakkhai was not white, sliced bread from a supermarket. It’s organic, wood-fired sourdough: home-grown, artisanal, nourishing and delicious. Pictured top are Andrew Robinson, as Kadmos, and Michelle Aslett, as Agaue. Photo: Sarah Mills. I Saw Bakkaii twice and loved its power to inform and enhance the original work. The community Cast were superb. The direction was beautifully managed and thoroughly inspired and the re-imagined script was perfectly captured for the time and place.